Home » Mattresses » What’s the Best Air Mattress for Everyday Use? What’s the Best Air Mattress for Everyday Use? When it comes to camping, everyone knows that air mattresses can improve your experience. However, you might face some issues as you look for the best air mattress for everyday use. For instance, you can handle just about any mattress for a couple nights, but you need to be more careful when picking an air mattress to use for months upon years. How Do You Pick the Best Air Mattress for Everyday Use? When it comes to the best air mattress for everyday use, more expensive does not always mean better. For instance, additional features may drive up the price, but you may not need these features. Instead, pay attention to the components the air bed is made of, look for a fairly simplistic design, ignore the media hype, choose one from a well-known manufacturer, and test your mattress before you buy it. Just as regular mattresses come in several sizes so do air mattresses. It is always a good idea to pair your inflatable mattress with the specific room where you are going to use it since you are going to use it at home. You would be surprised how often people buy the wrong mattress for their space. As the old adage says: “measure twice, cut once.” Or, in our case, it is “measure twice, buy an air mattress once.” Measure the space where your inflatable bed will reside, and keep in mind that a twin is 75” by 39”, full is 75” by 54”, a queen is 80” by 60”, a king is 80” by 76”, and California king is 84” by 72”. You do not have to worry about your feet hanging off of the edges with the California king or king size beds. This should be quite satisfying for even the tallest people since there are an extra five inches more than standard bed sizes. After all, comfort is everything when considering a long-term mattress. Height is also important. There are extra high mattresses that give you the feel of a regular bed. This will ensure optimal comfort and ease of use. When looking for the best air mattress for everyday use, I recommend going for the higher models. PVC plastic is the main material of choice when it comes to air beds. We have also witnessed the increasing popularity of textile reinforced urethane and rubber in the last couple years. All air mattresses need to strike a good balance of being thin enough for you to roll it up compactly when you deflate it and being sturdy enough to withstand your weight over long periods of time. You should consider an air mattress made of heavier material if you plan on using it every night. These air beds are typically more resistant to puncturing and weight pressure. You should also keep in mind that these inflatable beds may also cost you more. You can hardly distinguish today’s permanent air beds from the old-fashioned regular bed. Layers of foam or latex often coat the air chambers. 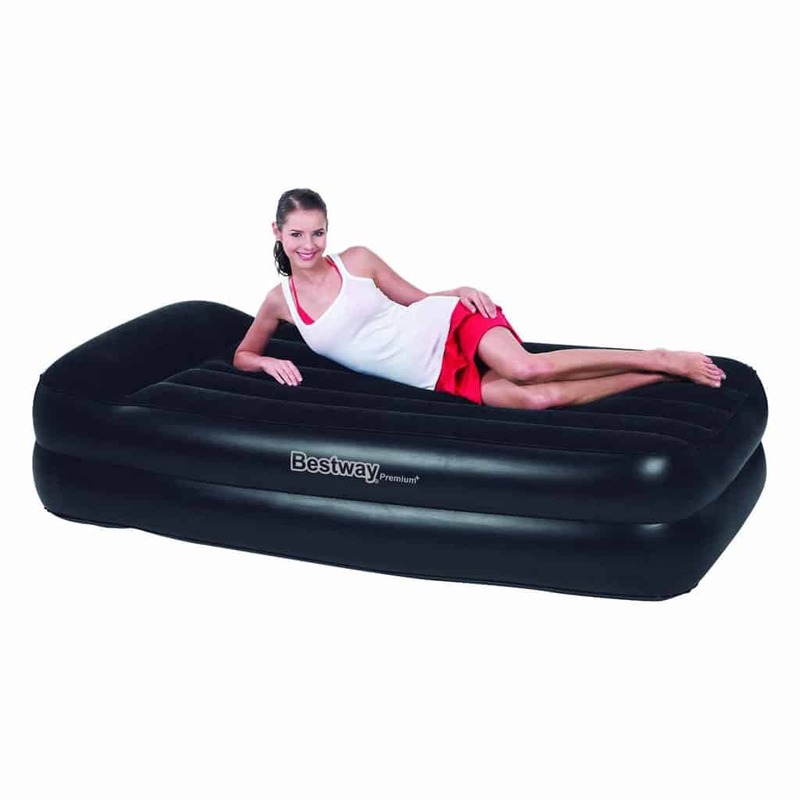 One of the most important aspects of your air mattress setup is the air pump. This is worth researching since manufacturers sometimes try to cut corners. While filling the mattress with air, the pump should work quietly. Loud clicking cannot be tolerated though a low hum is ok. When it comes to high capacity pumps, it is critical that they are outfitted with the latest sound dampening technology. The size of your bed will determine how powerful of a pump you will need. A good rule of thumb is that an air pump should be able to fully inflate your air bed from dead empty in under two minutes. Your pump should be UL listed and have as few moving parts as possible. This means there is less that could go wrong. The pump also needs to be easily accessible and not buried deep inside the mattress. If it does not have clear access in all directions, it could overheat. This is also helpful if you ever need to replace your pump. Most inclusive pumps come with a three-year warranty at the minimum. If you are one of the many sufferers of back pain, you know that no matter what position you try, you still end up with sleepless nights. Fortunately, your back pain can be alleviated with the help of a good air mattress. Water beds used to be great for treating these aches. Nowadays, air mattresses are the more affordable and effective alternative sleeping arrangement. You will not be able to cure your back pain with the standard roll-and-go camping mattress. That is not what we are talking about here. We are talking about the heavier air beds discussed above. Look for a premium, padded mattress with firmness levels that you can adjust. You can simply press a button to adjust the firmness of new age inflatable beds. Fighting back pain might be the best argument for using an air mattress, and even hospitals are starting to use these beds to reduce or increase pressure on certain parts of the body. The Quick Luxe Raised Air Bed Mattress has an array of features, including a luxuriously soft top, fast built-in electric pump, all of the materials are certified non-toxic, it uses the highest quality vinyl, and it is rated for 600 pounds of weight. I would say the main advantage of this air mattress is that it can hold firm for days on end without any need for re-pumping. Another benefit is that the pump runs quietly. The only downfall I found was that there was a rubbery odor that took a day or two to dissipate. 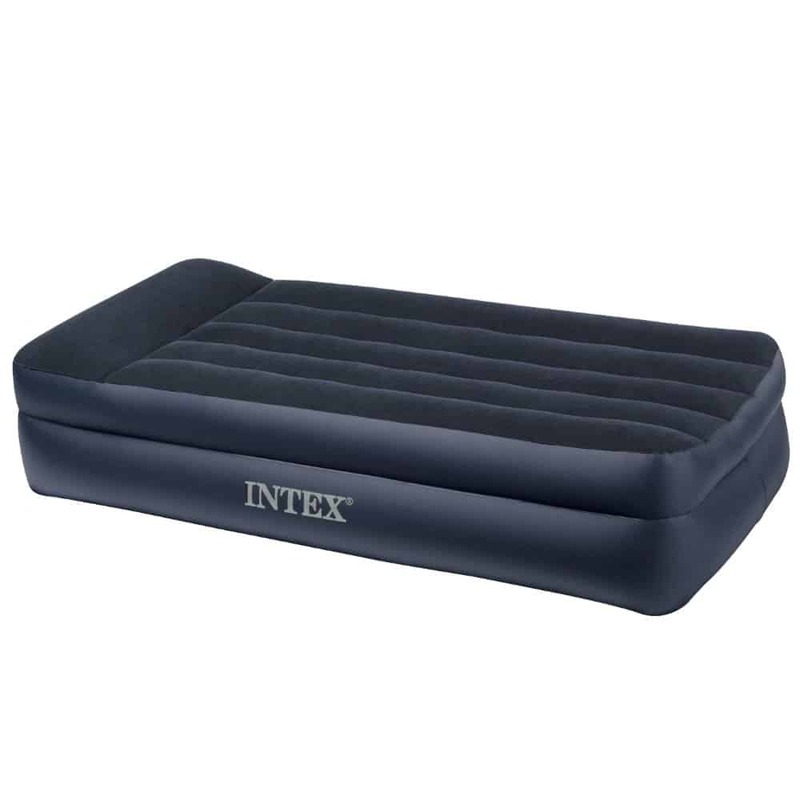 The Intex Pillow Raised Airbed is one of the best air mattresses for its price. It is engineered with Dura-Beam technology and is elevated nineteen inches, so you can get in and out of bed easily. The indented sides keep your fitted sheets from slipping, and the sleeping surface is covered with a soft flocking for added comfort. With just the switch of a button, you can inflate or deflate the air mattress using the built-in pump. The Pillow Raised Airbed is unique in that it is made with high-strength polyester fibers that do not stretch over time. This is the latest in Fox Air Beds’ line of air mattresses. It features excellent durability and airflow structure. This model has a plush-covered top as well as a two-inch gel memory foam topper. The comfort is comparable to a regular bed. The Plush High Rise Inflatable Air Mattress has the same height as a regular bed frame, which allows for easy movement into and out of bed. Plus, it offers a good place to sit when you put on your shoes and socks in the morning. If you are suffering from back or nerve pain, I would recommend giving this inflatable mattress a try. However, it is not recommended if you share the bed with someone who prefers a different firmness level than you since there are no adjustments for individual sides. The Bestway Raised Air Bed features a powerful built-in AC pump that plugs into your household outlets for quick inflation. You get a comfortable sleeping surface thanks to the built-in pillow and soft, flocked top. And, getting into and out of bed is a cinch with the eighteen-inch height. The Raised Air Bed is even rated for both outdoor and indoor use. A heavy duty repair patch and carry bag are included. Though this is a good choice for a wide range of people, I would say this might be better for those of you who like to be able to adjust the firmness of your bed quite often since that is easy to do with this Bestway product. Ivation is relatively new to the air mattress game, but they have a history of producing quality products in a number of other industries. This inflatable air bed has a built-in pump that plugs into your wall and inflates easily. 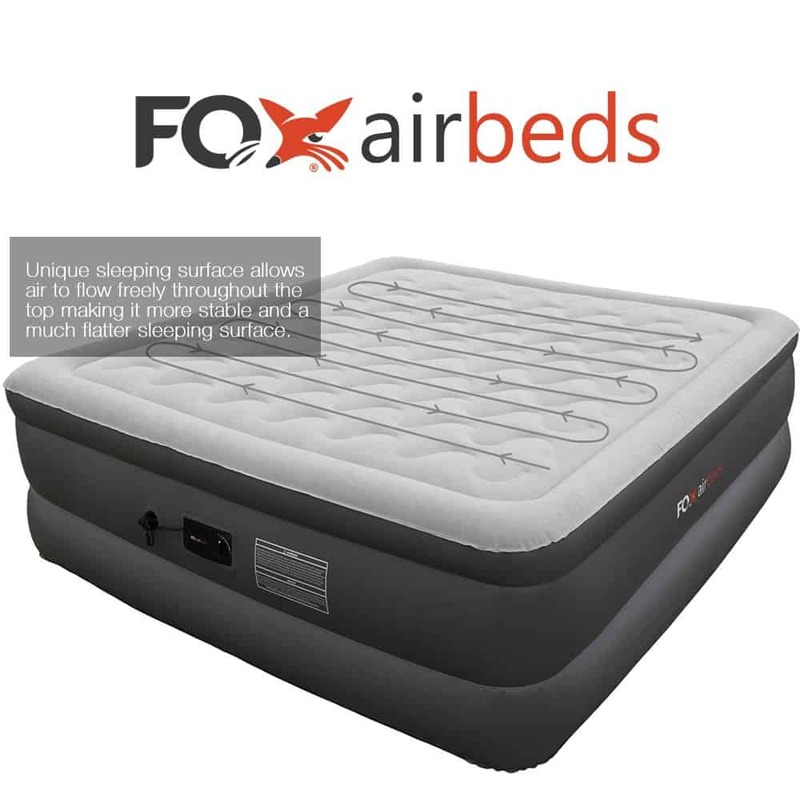 This mattress also features a double height air coil mattress construction. At 20 inches high, it is one of the tallest in the industry. It is rated to hold up to 500 pounds, is water resistant, has a plush flocked cushion top, and has puncture resistant PVC sides and bottom. The bottom is also slip resistant. You might consider this mattress for your personal use at home, in vacation homes, or for overnight guests. In summary, there are a lot of great products out there to choose from. No one air mattress will be best for everyone so I cannot say definitively what the best air mattress for everyday use is, but hopefully, you have learned enough here to make an informed decision on your own.